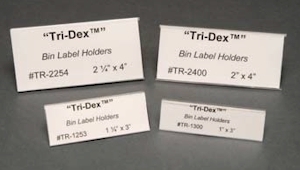 Clear Tri-Dex Label Holders - 25pk - Shelving, Inc.
Tri-Dex Label Holders are made from thick, crystal clear PVC plastic to ensure that your labels never bend or rip and can be easily read. Designed to fit into the front slot of almost any size storage bin, these label holders make identifying what is where incredibly easy and convenient. 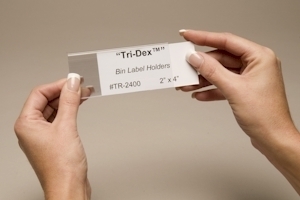 Clear Tri-Dex Label Holders are the standard label holders that can do it all. Organize the storage in your home, upgrade your storefront, or display a collection with these thinner, lightweight plastic label holders. 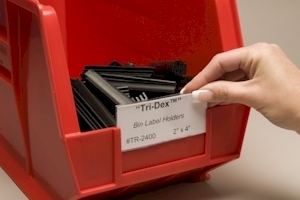 Made to easily fit into slots in storage bins, these label holders are perfect for any large collection or display.